Six people have been injured in a “serious collision” between a minibus and a lorry on the M4. 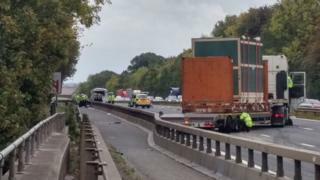 The crash happened just after 12:00 BST on the eastbound carriageway between junction 14 at Hungerford and junction 13 at Newbury. South Central Ambulance Service said three people in the minibus had been taken to hospitals in Oxford and Bristol with life-threatening injuries. The eastbound carriageway is expected to be blocked for “many hours”. Three other people in the minibus suffered less serious injuries and were taken to hospitals in Swindon and Reading, the ambulance service said. The westbound carriageway was closed to allow three air ambulances to land but has since reopened. Thames Valley Police have advised motorists to avoid the area if possible. The force of the impact had shunted the minibus between about 50 yards along the carriageway, he added. M4 closed due to worst accident I’ve ever seen in many years of driving. Avoid area and if you’re caught in the tail back be patient….I promise you don’t want to get past it until emergency services are finished.